Big Bad Wolf Stories Are Big, Big Fun for Boys and Girls! Rolf is happy to be a good little wolf. He’s helpful, he’s a vegetarian, he likes to bake and he’s a good friend to pigs and Mrs. Boggins. Rolf hopes he won’t ever encounter a bad wolf but, one day, when he is out walking in the woods, he meets the renowned Big, Bad Wolf. Big, Bad Wolf is quite dismayed at Rolf and his good behavior. Big, Bad Wolf expects wolves to howl and destroy houses and eat people. Big Bad Wolf challenges Rolf to be a “Real Wolf” and the good little wolf decides to give it a try. After a couple of disasterous attempts, Rolf discovers his inner ‘badness’ and proudly demonstrates his newfound abilities to Big, Bad Wolf. Success demands a celebration and before long Rolf, Mrs. Boggins and Big, Bad Wolf are enjoying a delicious meal together. Fans of I Want My Hat Back will delight in Good Little Wolf as will those who have enjoyed Mind Your Manners, B.B. Wolf and Tell the Truth, B.B. Wolf. Good Little Wolf will be enjoyed most by children who know the story of Little Red Riding Hood and the Three Little Pigs. It most certainly will prompt discussions about “good” versus “evil” and whether a leopard (or wolf) can change its spots. Simple, charming illustrations are a perfect match for both Rolf’s loveable personality and Big Bad Wolf’s nastiness. Three familiar tales are given ingenious ‘make overs.’ Readers are sure to enjoy comparing these terrific picture books with the traditional stories that inspired them. When Mama Fish sends Jim, Tim and Kim off to make their homes in the deep blue sea, a Big, Bad Shark is watching. It is not long before he knocks at a door and roars, “Little Fish, Little Fish, let me come in.” A really delightful addition to a picture book collection, youngsters will enjoy chiming in when the Little Fish replies, “Not by the skin of my finny, fin, fin!” Bold, bright illustrations complement this clever adaptation and ensure a very happy ending. Just as Casey could hit a baseball, Clancy is a star when it comes to hockey. When Clancy Cooke joins the Hogtown Maple Buds, hopes are raised for a Stanley Cup win. Alas, in the final moments of a playoff game, when Clancy takes a penalty shot, “The puck deflected off the post, like a comet to the sky. The Buds had lost the Stanley Cup – and the fans went home to cry.” A sure winner, especially for hockey fans and those familiar with the classic story of Casey at the Bat. 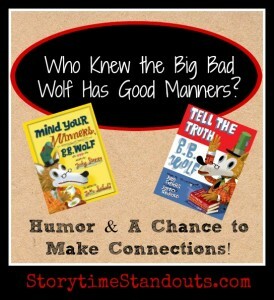 Who Knew the Big Bad Wolf Has Good Manners? When B.B. Wolf is invited to the local library’s Storybook Tea, he reviews proper etiquette, dons a dapper jacket and promises good behavior. After three cups of tea, a gurgling tummy threatens but Mr. Wolf remembers to say, ‘Excuse me,’ and is congratulated for his extraordinarily good manners. This picture book is a delight and I rank it among “The Best of the Best.” Youngsters are sure to enjoy spotting familiar fairy tale characters including Little Red Riding Hood, the Gingerbread Boy and the Three Little Pigs in addition to the Big Bad Wolf. It is indeed a treat to discover that Mr. Wolf has retired to Villain Villa and that using good manners can lead to happy endings. But wait, there’s more… Tell the Truth, B.B. 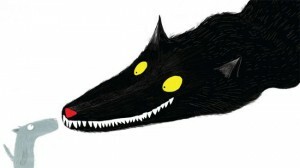 Wolf is an equally delightful tale featuring our “favourite” fairy tale villain! When invited to give his version of very familiar events, his credibility is soon called into question. Bold, retro illustrations compliment both stories beautifully. Highly recommended – especially for older children.